Esther and Ellen are two crafty friends who we've come to love...they've been our "Vancouver Card Hospital Triage Center" and have been helping out Sandy with a lot of other projects too! How long have you two been stamping? Esther: I started in the early 1990’s when I attended a Dozens of Terrific Stamps home gathering. Making my first card took my breath away. Have not stopped stamping since that first introduction to the world of stamping. 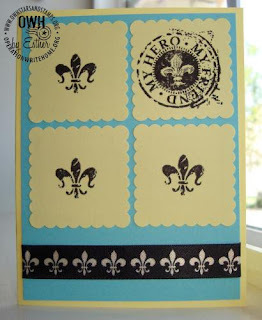 Ellen: 40+ years; I started stamping before stamps were popular and were hard to find. Do you have a craft room or specific area where you stamp? Esther: I share a computer room with my husband of 28 years, John. So I create at the desk and store papers and inks in the closet. Ellen: When my husband died, I took over his gun room and made it into a craft room. What are your favorite stamp products? Esther: Close To My Heart stamp sets fill a drawer, lots of boxes and cabinets. I also like papertreyink and other designers I find on the internet. Ellen: Close to My Heart stamps; Any punches. Indispensible tools include a pair of cuticle scissors and a pair of tweezers. Do you have a favorite technique? Esther: I love using printed paper and matching cardstock. If I can add a metal charm, I am very proud. Ellen: Stamp, cut and paste anything and everything. I like to use a punch in one spot on a card and in another area use the pieces that have been punched out. I also like to take unusual shaped scraps and make them into cards. I’m always interested in new techniques and will use items most people throw away and I use ‘mini’ stamps on the envelopes that match the card. Are there colors you love to include on your cards? Esther: Autumn colors are my first love. I am learning to branch out into spring and winter. Of course, I always love red, white and blue. Ellen: All colors. I like to use a spot of red to brighten up a drab card. I like bright colors and pastels rather than dark colors. How did you hear about Operation Write Home? Esther: Carol H. told me about Cards for Heroes just when it became OperationWriteHome. 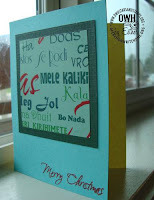 Ellen: Through Carol H, my cardmaking neighbor. What motivates you to make cards for our heroes? Esther: My 90-year-old dad was in the Navy in WWII, my brother was in the Army in the first Gulf War, and my son was in the Marines. I write a card to my dad every day so I can send my love. The cards I make for OWH also send my love to the men and women who have chosen to dedicate their lives to upholding the American tradition of serving the country with their lives. I honor all of them and am glad there is something I can do at home to help them when they are far away from their homes. Ellen: I remember how much my son liked getting mail when he was in the Navy and I have a grandson-in-law and granddaughter who are in the army. It’s the least I can do for our military personnel. great cards ladies! Thanks for supporting OWH. I love that Birthday flower card with the heart border. I am going to try to scraplift it. Thanks for sharing you lovely creations. It's the E Sisters!! You two are such inspirations for us all and I love getting together with you and being crafty. I just wish I didn't have to work so we could play more often! I LOVE your cards, both of you. You both have hearts as big as the whole outdoors! Beautiful cards and a wonderful Feature Friday! It's always a lot of fun to get to know a little more about the creative people who make up the OWH family. Nice cards and stories ladies, and it's fun to see your photos too! I love meeting all the fellow card makers at OWH through this blog! Thanks "E" ladies!! You are both awesome! How sweet! 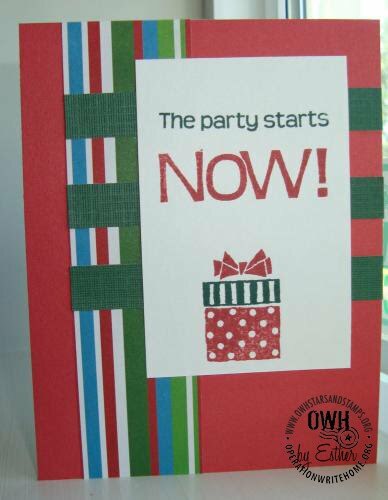 You are both wonderful crafters and it's so nice that you enjoy cardmaking and being such wonderful supporters of OWH! !